Read Daily Mashriq Epapers Urdu Newspaper Peshawar Today Epaper online. Peshawar is an Urdu daily newspaper Pakistan available from Peshawar, a major provincial of (Khyber Pakhtunkhwa) NWFP. Its Head office is in Bilal Town, GT Road Peshawar City. It is at present the leading Urdu language broadsheet of Peshawar since of its fact providing. 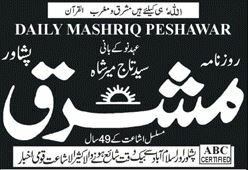 The online daily Mashriq is owned by the Mashriq group of newspaper, its chief editor is Syed Ayaz Badshah. It contains everything in it such as entertainment news, politics and current affairs, sports, children, etc. Read Daily Mashriq e-paper newspaper online, Mashriq epaper and Mashriq urdu epaper on dailyepaper.pk with Mashriq Peshawar, Islamabad, Karachi, Lahore edition.